The Industrie Lofts are located a quick 4 miles from Downtown Boston in a vibrant up and coming neighborhood. 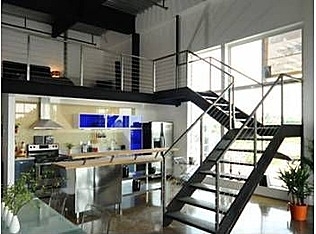 The building consists of 36 Loft Condo all of which are two level duplex style Lofts. Most units have Garage parking and all other's have outdoor parking. The Building was built with "Green" construction and have a modern, clean sleek design to them. All units have Polished concrete floors, 18" ceilings and walls of glass windows. These Chelsea Lofts come with Modern, Italian designed Domani kitchens, Frigidaire Gallery series stainless steel appliances including: electric oven/range with re-circulating hood, side-by-side refrigerator and dishwasher. Cabinets are finished with a baked paint lacquer and upper cabinets are gas loaded spring hinged with organic glass and aluminum trim. All kitchen work surfaces are finished with granite counters and backsplash. The Spacious Units are all two level's and have Open riser steel staircase's with wire stringers leads up to the mezzanine level. Unique to the Industrie Lofts are the Domani Steam Showers by Aston, complete with multiple body sprays, rain shower head and handheld. Bathrooms also feature a separate soaking tub/shower unit with granite tub surround. Can't find a unit you Like Now?